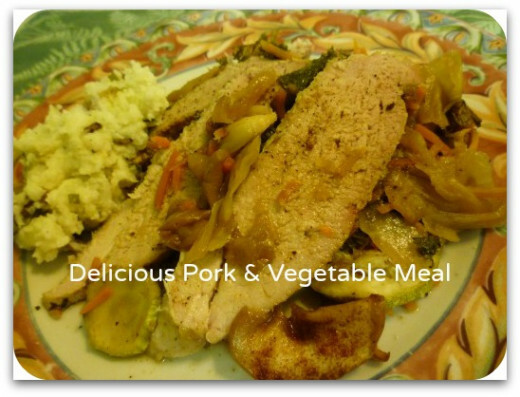 Delicious pork served with a medley of vegetables + horseradish mashed potatoes. My husband and I were shopping in our big warehouse store called Costco recently and they had some good looking pork sirloin tip roasts in the case. The meat looked very lean and the price was good so we decided to take some home with us. Like everything in these warehouse stores, the quantities are generally large. Sealed in plastic packaging was actually 4 roasts. In this original recipe that I created I only used one of them and the other 3 are now in our freezer. I had no idea what I would be doing with this pork sirloin at first so went back to memories of my mother cooking delicious pork roasts with onion, garlic and caraway seed. That makes for a great flavor combination using those ingredients plus salt and pepper. Since this particular cut of meat is leaner than most I knew that it would need juices surrounding it and probably a long and slow cooking time. So armed with that in mind, I looked in our refrigerator and pantry and concocted the following recipe. After removing the pork from the packaging, I washed it under running water and patted it dry using paper towels. Using a sharp knife I then removed most of the visible silver skin which is a tough membrane that is white in appearance. Once getting it started on one end it is easy to pull it up and continue to run the knife up against it pulling it away from the meat in a sawing motion. 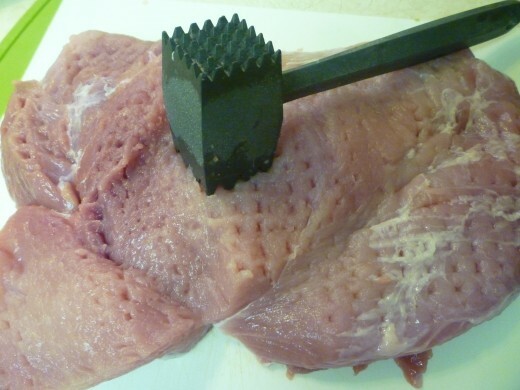 This shows how to remove silver skin from pork tenderloin but it can be applied to any other cut of meat as well. Reasons to remove the silver skin are two fold. 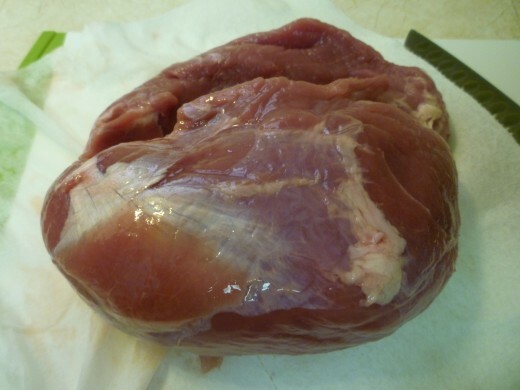 The skin can shrink during the cooking process and cause the meat to buckle and and not stay flat. This is more important when cooking tenderloin chops and the like. Herbs and spices one might be using get infused into the meat flavoring it better than if it stays on top of this tough membrane. Next, using a sharp knife I cut the roast opening it up to make a greater surface area but kept the roast intact. I tried to get is as even as I could. Pounding the roast to tenderize it the next step was to sprinkle salt and pepper as well as garlic powder over the surface of both sides of the roast. Setting the meat aside I next prepared the vegetables that were to be used for this recipe. I used a large stainless steel rectangular baking dish and sprayed it liberally with Pam so that the ingredients would bake and not stick to the pan. The next step was to slice the cabbage in approximately 3/4's to 1 inch slices and lay them down in the pan as the first layer. 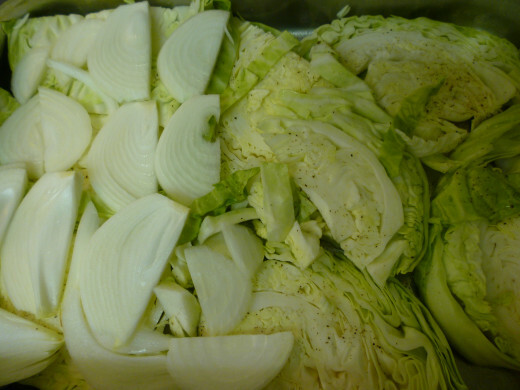 I followed that with thin slices of the sweet onion covering the first layer of cabbage. Note: Season each layer with a small amount of salt and pepper to taste and every couple of layers as you build the base for the pork sprinkle some caraway seeds. 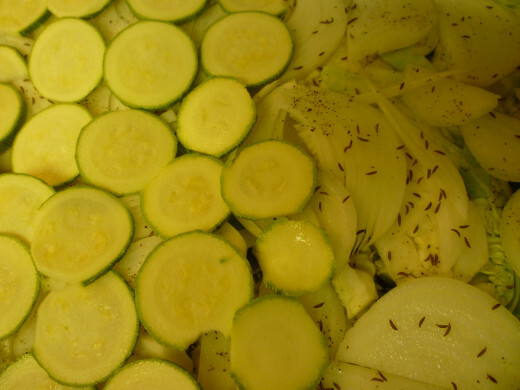 As you can tell from the photo above, I seasoned the onion layer with some of the caraway seeds and am now laying the sliced zucchini over the onions. 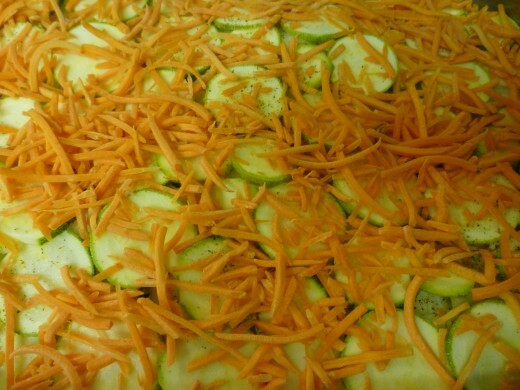 Next step was to add shredded carrots over the zucchini. 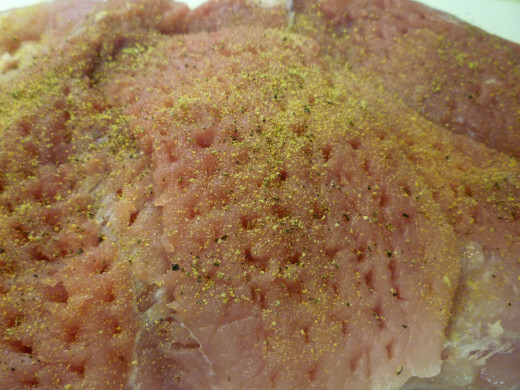 Add more salt and fresh ground pepper at this point. Use a light hand as you apply it as you do not want this vegetable medley to become too salty. This helps to build a depth of flavor in the eventual outcome of this dish. Wait until this stage to slice your apple (or apples, if they happen to be small) as you do not want them to oxidize and turn brown. I left the skin on for added nutrients. The apples lend a slight natural sweetness to this dish. Apples and pork are often a good marriage of flavors. 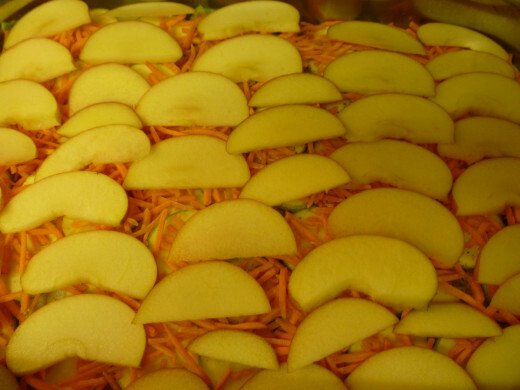 Layer the apple slices over the shredded carrots as seen in these photos. The final layer prior to adding the meat was to sprinkle fresh parsley over the top. Normally I use flat Italian parsley in cooking but this curly parsley from my garden was starting to bolt and go to seed. So I pulled it up and planted more Italian leaf parsley in its place, but did not want for it to go to waste. It is being used liberally in many different recipes coming from our kitchen until it is gone. It also tastes good, but is great when used as well for garnishing a plate of food. I grew up with the "Waste not, want not" school of thinking. 2. 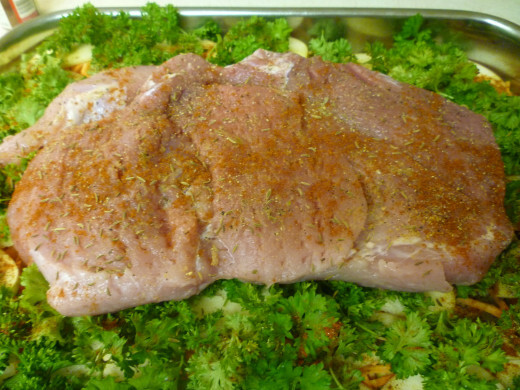 Remove meat from package, lightly coat roast with olive oil and season as desired. 3. Place roast in oven safe dish. 4. Cook uncovered for approximately 1 hour and 40 minutes or until internal temperature on a meat thermometer reaches 160ºF. in the thickest part of the meat. 5. Remove from oven and let rest 3 minutes. 6. 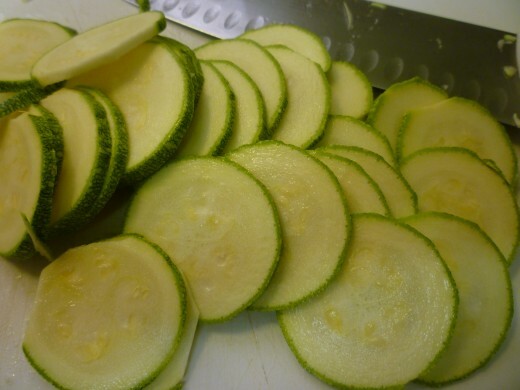 Slice across small ends into 1/8″ slices and serve. I might give this recipe a try next time, but I wished to use the many vegetables that I had on hand for the recipe that I created and am sharing here. 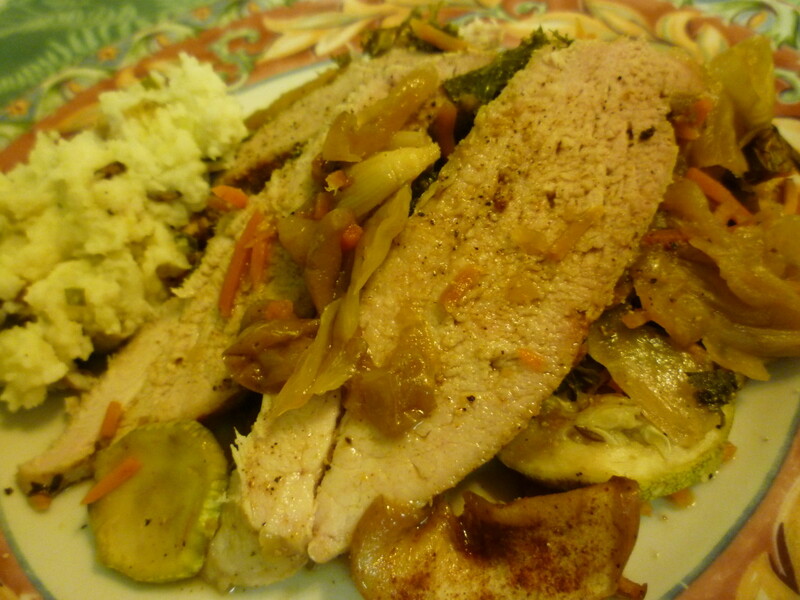 Seasoned pork put on top of the layered veggies. As you can see from the photo above, the already flattened and pounded pork that was seasoned with salt, pepper and powdered garlic powder was laid on top of the parsley. At this point give it a final liberal topping of more caraway seeds and the paprika (as much or as little as you wish) and more garlic powder if you like. 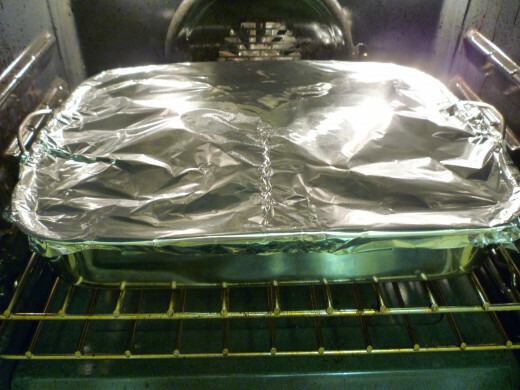 Tightly seal the pan with aluminum foil and put it into a preheated oven at 325 degrees Fahrenheit. 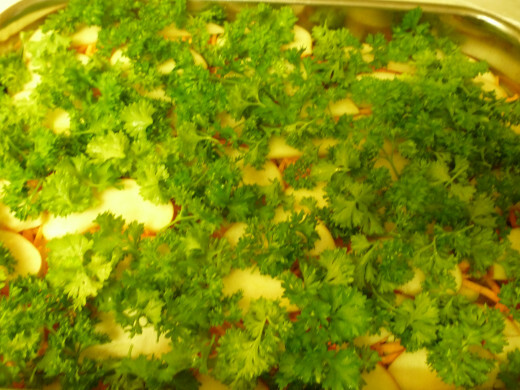 These vegetables that are baked in a slow oven will draw juices and keep everything moist. No added liquid is necessary. Start checking after an hour of baking time to see how this meal is progressing. It was intended to bake this meal slowly over a long period of time. Depending upon the fat content of your meat it may cook faster. 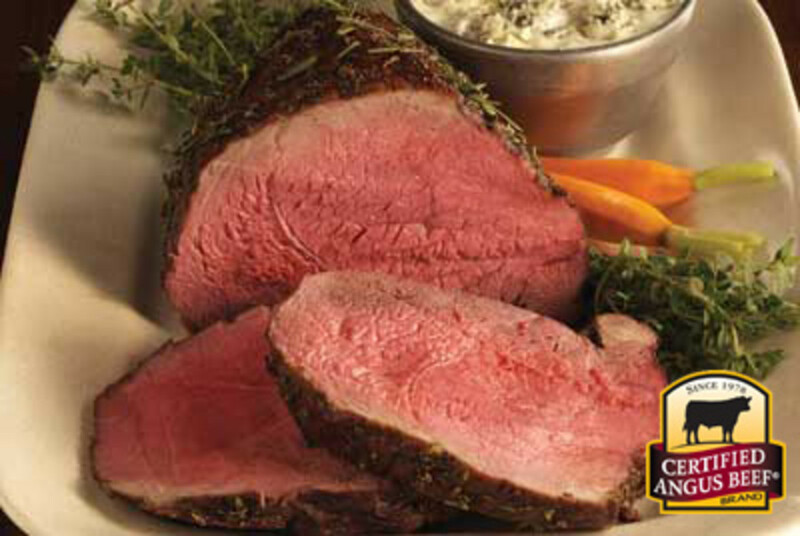 A sirloin tip roast is extremely lean. Our meal was ready in a little over 2 hours of baking time, but ovens can vary as well as different cuts of meat. About halfway through the cooking process I flipped the meat over and spooned some of the juices and a few of the vegetables over the top. Dish covered with foil and put into oven for baking. 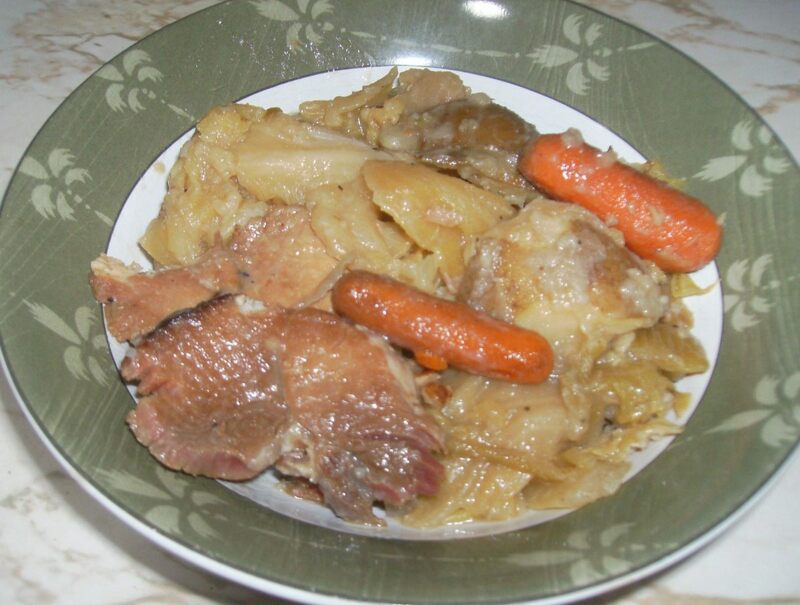 When the meat was fork tender I took it out of the baking pan removing it from the rest of the vegetables and put it on a plate as shown below. After a few minutes of resting time it got sliced and was served over a mound of the mixture of vegetables with a side dish of some horseradish mashed potatoes. While the meat is resting to allow the juices to remain in the meat, it can be tented with a piece of foil to keep it warm. They are not only high in fiber helping bowels to stay regular and preventing cancers in the colon, but are full of healthful vitamins and minerals plus anti-oxidants for good measure. Does eating cabbage make you gassy? The caraway seeds actually help treat flatulence as well as problems of indigestion. It is often paired with dishes containing sauerkraut or cabbage and is also found in products like breads, cakes and even cheese and sausage. Calories are low coming in at 5 calories for 3/4 of a teaspoon. It can freshen breath and is found in some mouthwash preparations as well as some lotions and soaps. It is a very versatile little seed! This original recipe turned out to be delicious. We are still eating it and the meat has stayed moist and delicious flavored as it was with the juices of the combined ingredients. Hope that you enjoy it as much as we have if you decide to make it. Obviously this is a meal where ingredients and amounts of items can easily be altered to suit your taste. Please rate this recipe. Thanks! Does this look like a dish that you will be trying? Yes...it sounds and looks delicious! I do not eat pork...so probably not. I might make a similar dish but alter it a bit as to ingredients or preparation. I seldom cook at home. I'll give this recipe to someone else who might make it for me! 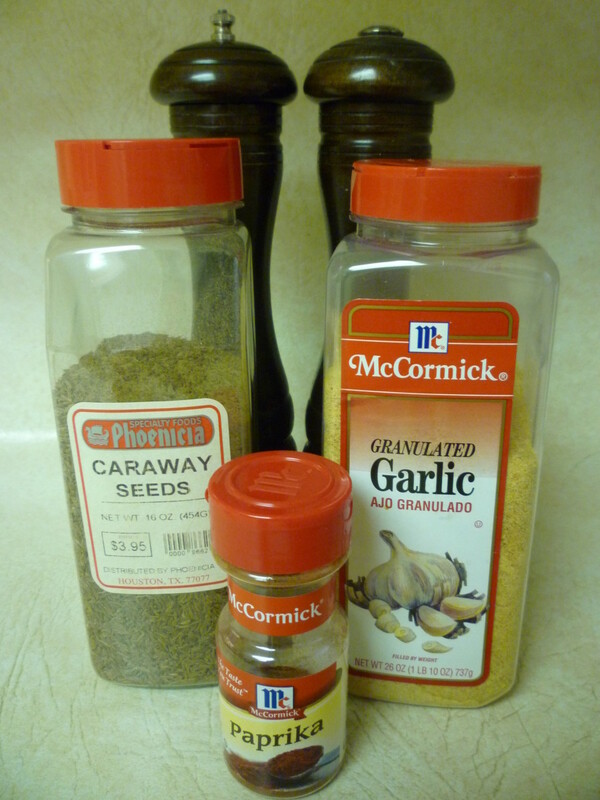 It is interesting that you do not have access to caraway seeds in your area. 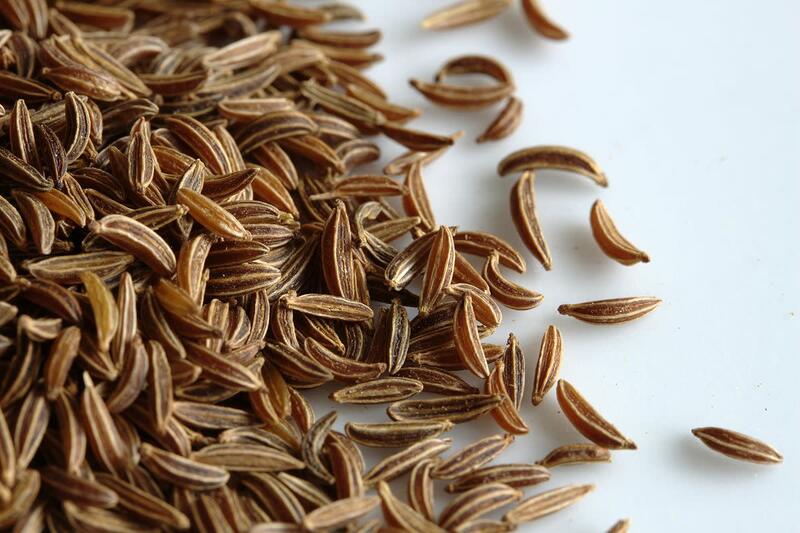 While they may look similar to cumin seeds, caraway has a distinctively different flavor. Both are good. A very interesting medley of ingredients. We do not get caraway here. It looks a lot similar to cumin since both belong to the same family. Thanks for sharing. Yes, it would be easy to swap out and use other vegetables according to what is readily available or what is preferred. I agree that pork and caraway seeds are a good match. Making little slits (cuts) into the meat and inserting slices of garlic cloves is also good. My mother often did that with pork roasts. Thanks for sharing my recipe with your son. Hope he likes it. It would be hard for me to totally give up eating meat...especially pork. Kudos to you for doing it! Before I became a full fledged vegetarian I couldn't resist pork. I grew up on my mothers pork chops. Your recipe is magnificent! I'm passing it on to my son (a great cook) and he will love it. I have to say, your photos leave my mouth-watering. I almost want to go back to eating meat. Will do some sharing and thanks Peggy! Pork is such a versatile meat in that it can be cooked in so many different ways. Glad you liked the sound of this recipe which I created out of things I happened to have on hand. It sounds as though you might be vegetarian now from your comment. When I ate meat, pork was my weakness. You sure created a winner here, especially with the apple, which truly enhances the remaining flavors. You've done will with this one, and one day I might have some folks over and try a sliver or two. Most pork is actually quite easy to cook. This was an experiment of mine that turned out tasting great with all of the vegetables, etc. Glad you like the sound of it. This is a very useful recipe for me. I'm hopeless at cooking pork and have never mastered it. It doesn't look all that hard now! Voted up, useful and pinned to my recipes board - thank you so much for educating me on how to cook pork properly! Glad you liked all the photos of the preparation for this meal. 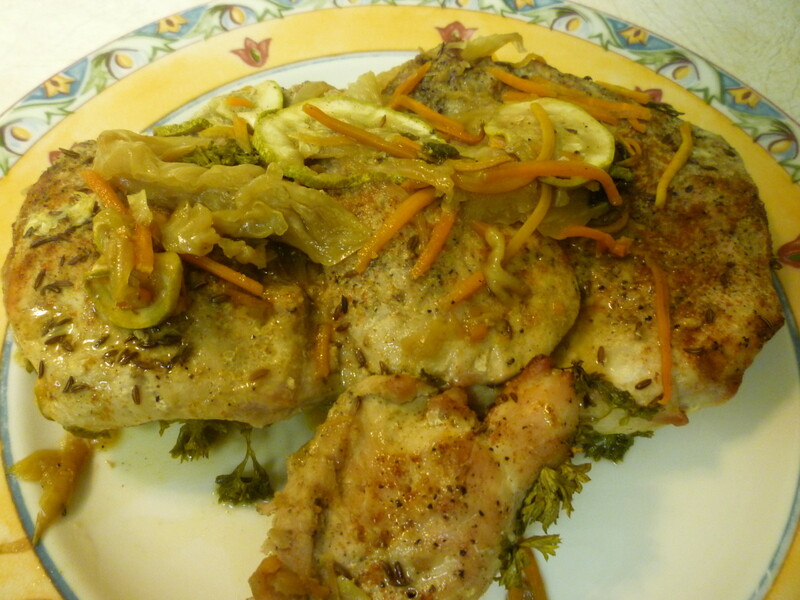 Pork and Caraway Seed always make for a flavorful combination! Good presentation. You even make the preparations look good. So glad you liked the sound of this recipe. A scratch and sniff component would be wonderful! Ha! This did have wonderful flavors. Hope you give it a try. I was really itching to click on your article below this one about an apple dessert. But I am trying to diet and I figured I might as well get a new recipe that I AM allowed to use so I begrudgingly clicked on the vegetable medley option. And now that I've read it I honestly forgot all about the apple something or another. It has made me hungry and wanting to try this out! I wish there was a "scratch and sniff" widget that could be added to recipe articles! It looks wonderful! What a great way to cook and serve pork. It really does look delicious. I love your easy step by step guide too with all your photos, it makes this recipe very easy to follow. Glad you liked the sound of this recipe and the ease of preparation. Enjoy! HOW have I never thought of horseradish mashed potatoes???!?!?!?!?!? Guess what I'm making tomorrow? 5 Stars! Those are really good pork roasts from Costco. They would be perfect to cook in a slow cooker such as you did especially after first browning them. Thanks for your votes. Hi Peggy, I picked up a four pack of these pork roasts at Costco, too, and have cooked two of them in the crock pot, after browning them in a shallow pan first. I like the recipe you've shared here and it really sounds like a winner. The veggies really give it a nice touch. Voted up, useful and interesting. Oh you lucky girl to have most of those ingredients growing in your own garden! Hope you enjoy this recipe as much as we did! I have most of this stuff in my garden right now, and I love pork (I actually prefer it to beef). I'm sure I will be trying this out sometime soon. Thanks for sharing your recipe and great cooking tips. Yes, this would be an easy enough meal to cook for a weeknight meal. Enjoy and thanks for your comment. This looks delicious and it looks easy enough to make for a weeknight dinner. Glad you liked the accompanying photos along with the instructions as to how to make this dish. Thanks for your comment. This looks like an exceptionally tasty dish, and you did a group job presenting it with your photos. Thanks! Thanks Au fait for the pin and share. Cooking for one can be a challenge. I always admired my grandmother who cooked good balanced meals for herself well into her 80's. This always looks so delicious. I don't do a lot of cooking anymore because there's only me to cook for, but this really does look so yummy and easy to make too. 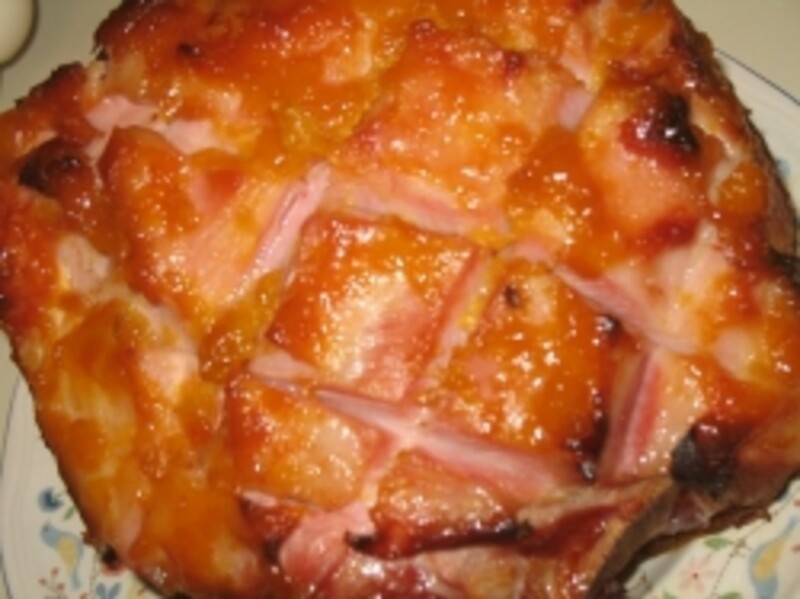 Going to pin this delicious recipe to Awesome HubPages and share again with my followers. A nice recipe that you have here. Will try soon enough. Thank you. Voted up. A healthy and delicious meal-my kind! Thanks for sharing! This is not the typical pork roast recipe. They can be simply roasted in an oven and are so good. My mother used to make slits in the meat & insert slivers of garlic, salt & pepper the outside of the roast & also sprinkle some caraway seeds over it. Yum! Thanks for the pin. So glad to know that you like the sound of this. Enjoy! So happy to hear that you liked the sound of this recipe. We also like pork and eat quite a bit of it in different ways. Thanks for the share. So glad that you liked this recipe and also the photos. Thanks for your comment. Pork is my favorite, and this looks so good. What great photos! Thanks! Shared! Very well written and love the photos. Caraway seed is such a distinctive flavor. I grew up with my mother seasoning her pork roasts with it and I love it. Hope you try it and let me know how you like using it. Thanks Au fait! Stay warm up there. We seem to be having a colder year than normal in Texas. @Peggy W--This recipe looks so tasty that I could almost smell it cooking as I was reading it. I have never used caraway seeds in any dish before, but I've recently seen several vegan and vegetarian recipes that use them too. Great Hub. Voted up!! Glad you learned about how to remove the silver skin from pork. 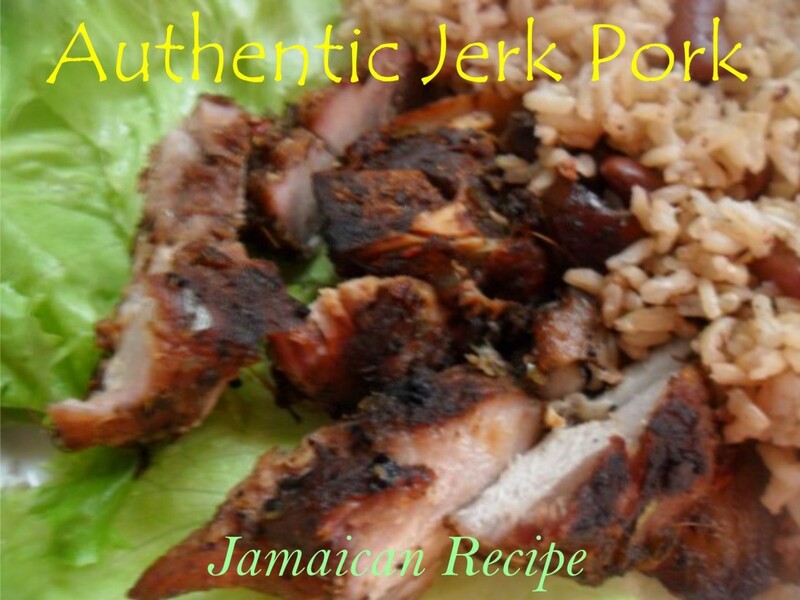 Appreciate your commenting on this recipe. Hope you enjoy it! This looks and sounds fabulous for this cold snap we're having in North Texas. With the colder weather here and the holidays too, this would make a wonderful meal to come in out of the chilly weather for. Pinned to 'Awesome Hubpages,' voted up and awesome, and shared again. This is a really good recipe idea. I love apples with pork. I learned something new on removing the silver skin. Thanks for sharing your personal recipe. Oh this sounds heavenly. I'm going to bookmark this recipe, and voted up! So glad you like the sound of this recipe. Enjoy! Thanks for your comment. Thanks for sharing this. I love pork and my wife likes vegetables. This will be a great addition to our meal. Came back to pin this wonderful recipe to my "Main Course Recipes' board, and to share again with my followers! Glad that you enjoyed these instructions. Caraway seed and pork go well together. When my mother used to make pork roasts, she would almost always use some onions, garlic and caraway seed. Yum! The aroma is heavenly and the taste surpasses that. This looks so scrumptious! I confess I don't always remember or know some of the tips of preparing or cooking different meats properly so appreciated these great instructions. The veggies added sound wonderful...I have never cooked with caraway seeds so definitely want to try this! I created this dish which is probably why you have never heard of it. You have now! Ha! Thanks for sharing this. It really turned out great! Thanks for the information and comment on this hub. It won't hurt, but you don't have to do that if you don't want. Lean, trimmed red meat is a good socrue of iron and protein. You don't want to overdo it, of course, but once a week won't hurt at all. Pork is a little harder to digest, but some cuts like pork chops can be trimmed and provide adequate protein.Lean chicken breast is a good option. Oily fish like sardines and salmon provide omega 3s, but are high in *(good) fat, so have to be measured carefully when added to diet plan. Be sure to supplement calcium and a multivitamin when you go on your diet to fill in any nutrients you accidentally cut out.Good luck with your challenge! So happy to hear that you liked this recipe. Appreciate your comment. Awesome recipe and so easy to make thanks for sharing this recipe. That is good advice. We always make sure our pork is well cooked and one can always use a meat thermometer to make sure of it. Thanks for your comment. Depending on how the meat was processed and where it came from there is a risk of geinttg a parasite called trichinosis. 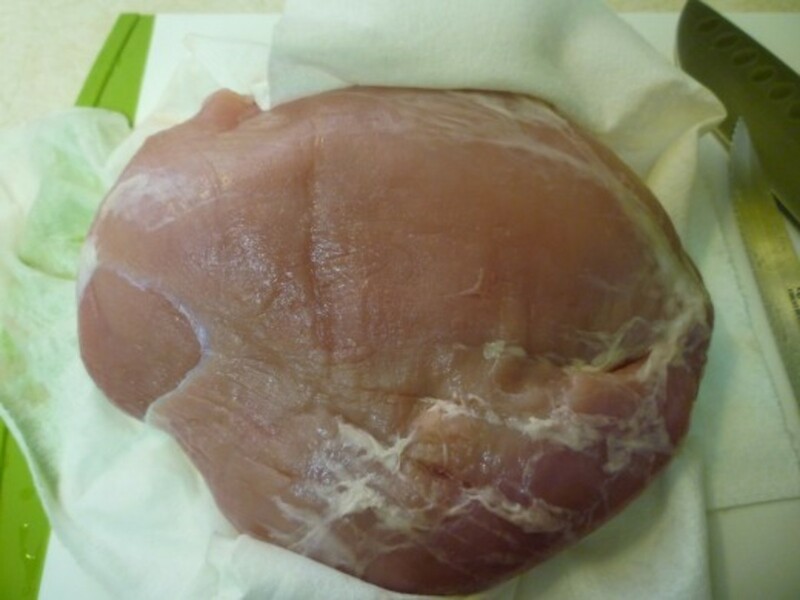 There are other bacteria, that grow in undercooked meat that you might also be exposing yourself too. It is always recommended to cook meat to proper temperatures before eating. I was the only one to vote for I seldom cook at home. It was a trap! Look's great as usual Peggy! Glad you liked the sound of this recipe. Hope you are doing well. Wonderful Peggy and voting up. So glad you liked the sound of this very healthy meal. Thanks for the shares. So happy to hear that you like the sound of this recipe. Enjoy! I will definitely be trying your recipe. Thanks so much for sharing it. Glad you liked this recipe. Hope all is well with you and those you love. Wonderful recipes and thanks for sharing. You've shared a delish dish here that will make a hearty meal with summer-fall veggies for us--thanks! Pinning to Ways w/ Food: Eggs, Fish, Meats board. Just the silver skin is important to remove. 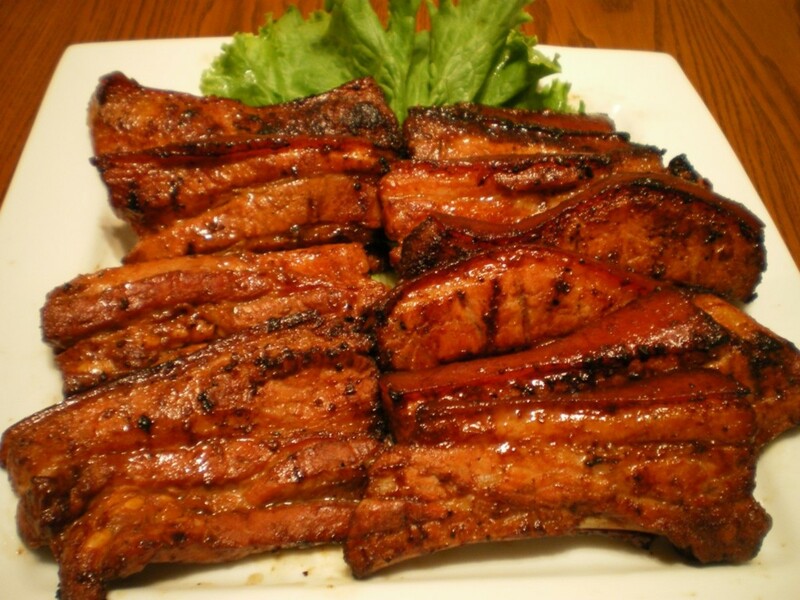 It is tough and can cause the pork to curl and perhaps not cook evenly depending upon the thickness. Glad you liked this. Thanks for the vote + share. This recipe looks amazing and I can't wait to try it. I like anything with a lot of vegetables and layering them is a great idea. I was unaware that it was important to remove the skin on the pork. Voted up and shared! Yes, it certainly would feed a number of people! Thanks for the vote and share. Hope that you enjoy it and thanks for the shares. Sounds delicious. This pork, caraway seed and veggie bake would be a great "share-a-meal" for a get together. Thumbs up and shared. This looks absolutely delicious, Peggy. Am sharing and pinning. Wow, you are so creative! I have put an apple in a recipe before to give it a little sweeter flavor. It's a nice touch. I like caraway, too. Great with cabbage. Excellent hub with all the photos and explanations! This meal turned out great. With another one of the Costco pork roasts, I just followed the instructions on roasting it whole but still had onions around it and seasoned it with salt, pepper and the caraway seeds as well as some garlic. Great combination with pork! Thanks for your comment and votes. I've never thought to put vegetables and pork in this way, and the caraway seed just adds something special. I love the pictures, as usual. Voting this Up and Useful. So happy to hear that this gives you the incentive to add caraway seeds back into your spice cabinet. My mother loved them so much that she would sprinkle some on her cottage cheese and eat them that way. Appreciate your comment. What a wonderful sounding and looking recipe, I bet those gala apples add the perfect touch. You've given me a new reason to add caraway seed to my spice cabinet again. It is easy to get stuck with the same ol' seasonings but this combination sounds divine, thank you for sharing. 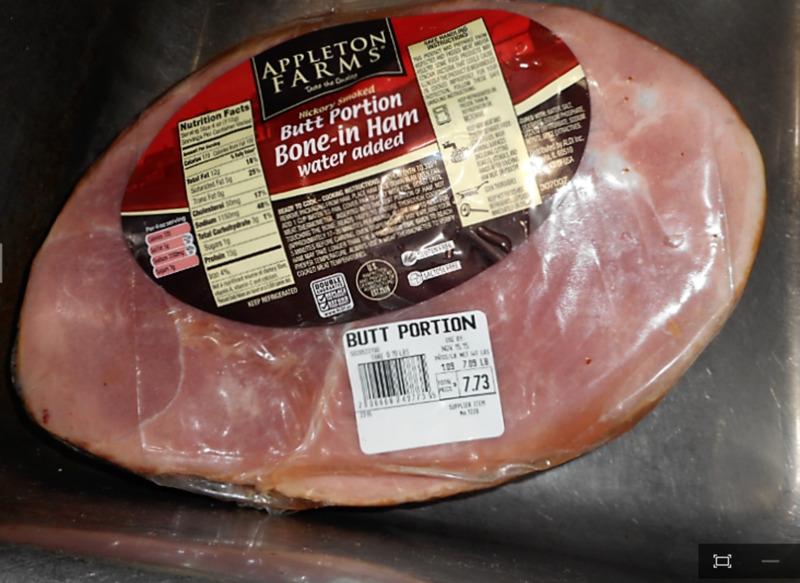 Oh, and thanks for the great tips on how to prepare the pork before cooking. Would be happy to but I'm afraid the plane flight is a bit expensive to do it for one meal. :)) Glad that you liked the sound of this recipe. All those veggies, wow! can you come over and cook for me? I love pork with anything, but your recipe was great! This has to be good!! Simple straightforward flavors which bring out the goodness of the pork. And who does not love those amazing veggies. Thank you so much for sharing....I can almost smell this cooking and wished I could have a taste..
Angels are on the way to you this morning, Peggy. I also love using caraway seeds in sauerkraut. 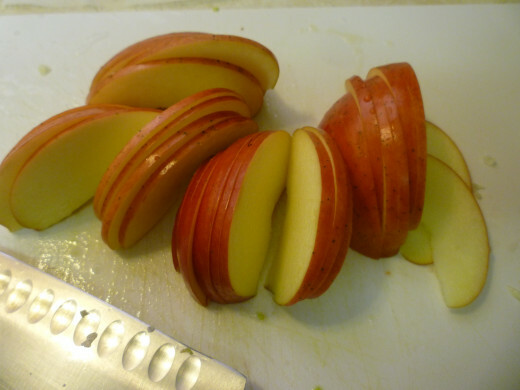 Grate some apple into it and/or potato and use caraway seeds. Obviously the apple gives sauerkraut a little sweeter taste than the potato...but both are good. Hope you like caraway seed flavor as much as we do. Thanks for your comment. it is my first time to learn about caraway seeds. this is an interesting recipe. i would love to try doing it first and make some alterations in the future if needed.